Some hospitals do worse than others in providing follow-up care after psychiatric inpatient treatment, UMD researchers say. 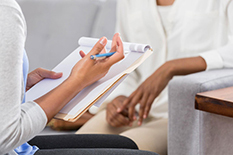 Hospitals in neighborhoods with high proportions of minority residents and rates of poverty are much less likely to administer mental health follow-up care after psychiatric hospitalization than other institutions, according to a new School of Public Health-led study. Psychiatric specialty hospitals and public hospitals also had low rates of follow-up, according to the study published this month in The American Journal of Geriatric Psychiatry. In it, Associate Professor Jie Chen and doctoral student Ivy Benjenk analyzed seven- and 30-day mental health follow-up rates among Medicare recipients, most of whom are over 65, for different hospitals in 2015. Minority communities often face disadvantages like fewer providers and greater stigma for seeking mental health care; the study’s results suggest that state and local health departments must ensure they are meeting the needs of those neighborhoods, Benjenk said. “It’s important for local health departments and states to look at the data and ask, ‘What can we do to support hospitals in minority communities?’” she said. Follow-up rates are frequently used as measures of health plan and hospital quality, and facilities are expected to develop successful and comprehensive plans for follow-up after discharge. This is particularly important for older adults, who need closer medication monitoring to avoid falls and other hazards. While minority- and low-income-focused hospitals performed worse, it’s unclear whether that is due to poorer quality care, weak infrastructure for behavioral health services in the area or social determinants of health that interfere with follow-up, the study notes. Benjenk and Chen paired the Medicare-provided follow-up data with hospital information provided by the American Hospital Association Annual Survey and Census demographics for the five-mile radius surrounding each hospital. Hospital follow-up rates ranged from 16 to 95 percent, with an average of 56 percent. The wide range implies much room for improvement exists at many hospitals, the study notes.